Prescription diet pills are considered to be a last resort. They are powerful, pharmaceutically created chemical substances that may cause serious side effects and that is the reason why a physician supervision is always necessary. It is important that those who want to take prescription diet pills be under the supervision and care of a doctor/physician to make sure there are no complications. It is also important that those who want to use prescribed medication inform their doctor about any over-the-counter medications, herbal formulas, and other supplements they are currently using. In the main, prescription diet pills are used when other treatments fail or rapid weight loss is necessary and a considered risk. People who have a BMI (body mass index) of 27 and over generally use weight loss pills when they are at risk of suffering from high cholesterol and diabetes. People with BMIs over 30 are considered obese and are recommended to use these medications, even if there’s no risk factor. However, sometimes doctors avoid prescribing pills for people with high blood pressure, cardiac disease, glaucoma, and hyperthyroidism. Prescription diet pills are usually one of the best products one can buy for their weight loss. However, they are the most expensive as well, and one needs a doctor’s prescription to obtain them. The pills are meant for people who are extremely obese, such that it’s causing them major health concerns. The pills work by employing one of the two main strategies. They can either suppress your appetite or block the ability of your body to absorb fat. Appetite suppressants act exactly as their name suggests, they stimulate the brain in such a way that it thinks the stomach is full. They specifically target serotonin and norepinephrine, which goes into the hypothalamus area in the brain, creating the sensation of a ‘full stomach’. When one thinks their stomach is full, they’ll eat less and start to lose weight. There is a wide range of commercial products made by various manufacturers, which help to suppress one’s appetite. Other prescription diet pills help in weight loss by blocking the body’s ability to absorb fat. These pills cause a decrease in an enzyme called lipase. With less lipase, the body’s ability to absorb fat is limited. Although prescription diet pills may be among the most effective weight loss drugs on the market, they should be used only in the right circumstances. And they must be prescribed by a health care provider before use. 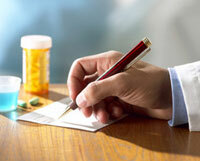 Various prescription diet pills are still undergoing safety tests. Drugs that have many benefits to the user are usually the ones that are approved. There are some prescription diet pills that aren’t safe for people with heart problems as they increase blood pressure levels. All prescription diet pills have some minor and major side effects. Some of the most commonly used prescription diet pill brand names include: Adipex-P (Phentermine), Meridia (Sibutramine), Ionamin (Phentermine), Ionamine (Phentermine), Duromine (Phentermine), Xenical (Orlistat), Fastin (Phentermine), Tenuate (Diethylpropion), and Anorex (Diethylpropion). Prescription diet pills are widely used because they help people lose weight within a short time.However, they cannot work alone. Therefore,they must be supplemented with a healthy lifestyle that includes a proper diet and plenty of exercise. This entry was posted in Prescription Diet Pills and tagged adipex-P, Meridia, Phentermine, prescription diet pills, xenical. Bookmark the permalink.